For centuries visitors have been awed by ancient Egypt's monuments, seeing in them testimony to a mysterious past and the remembrance of forces greater and more subtle than the corporeal world they inhabit. 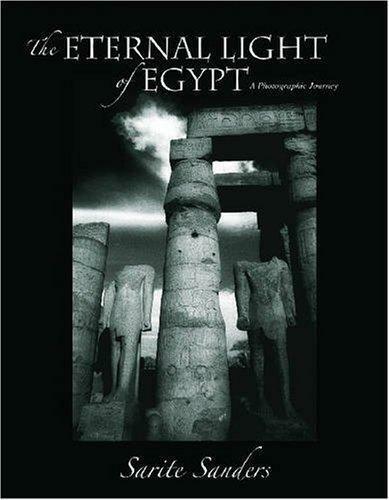 With stunning photography complemented by quotations from a range of textual sources, "The Eternal Light of Egypt" speaks to that testimony with a fresh, exploratory voice. A brooding face carved in stone, monuments of unsparing majesty, clouds spread out against an immutable sky, delicate patterns of palm fronds caught in a shimmering half-light. Like the figurative language of dreams, Sarite Sanders's haunting black-and-white photographs bring the enigmatic narrative of Egypt's ancient monuments into sharp relief, forcing us to see pyramids, statues, or the breathtaking architectural sweep of temples once again for the first time, in an austere and unscripted visual poetry.Photographed using infra-red film, the images are often dark and edgy, hinting at an underlying restlessness and the transience of all those who stand in the monuments' shadow. With over 100 black-and-white photographs, "The Eternal Light of Egypt" is both a meditation and a rare, lyrical work, inviting the observer to revisit and engage with Egypt's most enduring legacy to the imagination.